Made from their famous Tonkotsu broth with pieces of pork belly, kikurage mushrooms, cabbage, onion, ground pork and scallions this hearty bowl of ramen has enough spices to clear out your sinuses and let you taste food again. 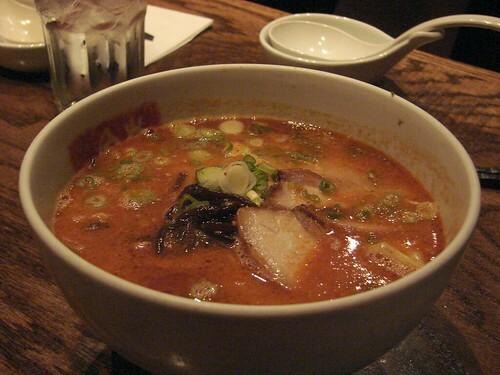 If this were on the regular menu, it might quickly become my go to dish at Ippudo. Karaka-men FTW! oh man, Ippudo, love this place. If only the waits weren't SO long. By the way, I just started a food and travel blog myself. Let me know what you think! Any suggestions are welcome. I've been coming here for ramen, since I moved to NY about 2 years ago; but yesterday, I abruptly left the restaurant when management decided to slap me with a surcharge of $4/person for eating a cupcake in their restaurant. No one gave me a warning, but they just automatically added the ridiculous surcharge to my tab. I went late in the afternoon, and did not have to wait for a table, but for some reason, things were EXTREMELY SLOW in the kitchen. I mean, come on, it should take 5 minutes to bring out a bowl of ramen. I was STARVING and the only thing to stave off my hunger were the cupcakes that I bought from Butter Lane. I asked if, instead, I could order an appetizer or drinks, but they didn't even give me the option. Moreover, I think it's annoying when this "policy" was not listed anywhere on the menu. The manager on duty said management is allowed to do whatever they please, but shouldn't they, instead, try to please the customers? Afterall, you are paying $15 for a bowl of peasant food. 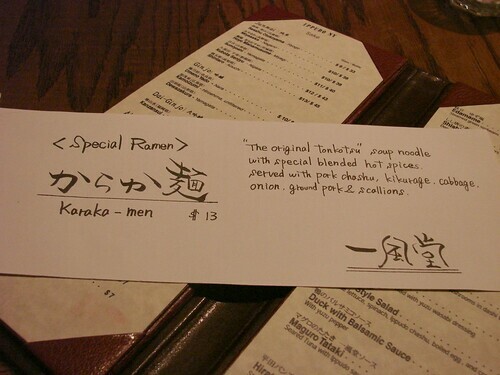 So fellow ramen enthusiasts, beware!